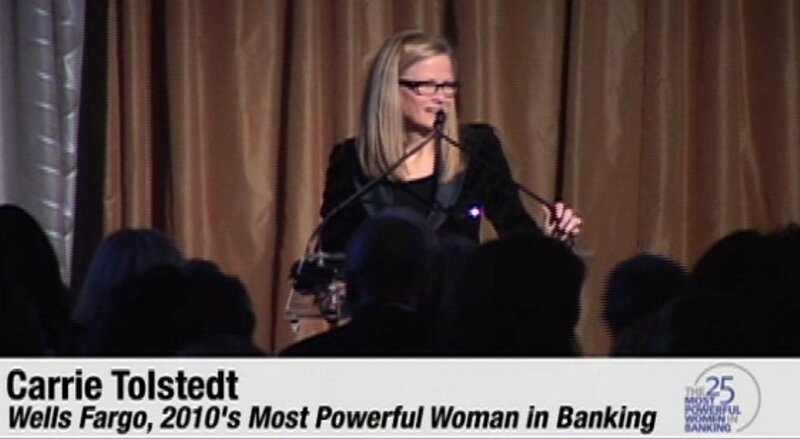 Normally, companies that give "performance pay" to their execs can only write off the first $1M: but when Wells Fargo gave $125M to Carrie Tolstedt (shown above receiving American Banker's 2010 award for being "the most powerful woman in banking") as she "retired" after overseeing a 5-year period in which Wells Fargo's top brass were aware that their employees were opening 2 million fake accounts in their customers' names, Wells structured the payment as a "bonus," meaning that the company took a $78 million off its taxes, pocketing $27m in savings. This taxpayer-funded subsidy went to an executive who watched as the company fired multiple whistleblowers who reported the fraud, which ripped off and lowered credit ratings for millions of Wells Fargo customers. Under Wells's own rules, the company is entitled to claw back some of Tolstedt's bonus, but they have signalled that they will not do this. “This is just one more example of how the notion of ‘performance pay’ is a total hoax,” Anderson told International Business Times. Anderson is the author of a recent study which documented how the exemption translated into a $725 million subsidy for the top 20 U.S. banks over the past four years. Banks continue to use these subsidies even as government regulators charged them with breaking rules. Between 2012-2015, Wells Fargo cashed in on $54 million in tax subsidies for CEO John Stumpf’s compensation, according to the IPS report. Over that same period, regulators extracted $10.4 billion in misconduct penalties from the bank. Tolstedt was paid $850,000 in 2015 as a bonus for “increasing online and mobile banking customers.” But two years earlier, the Los Angeles Times revealed that Wells Fargo was boosting these sales by opening accounts without their customer's permission.